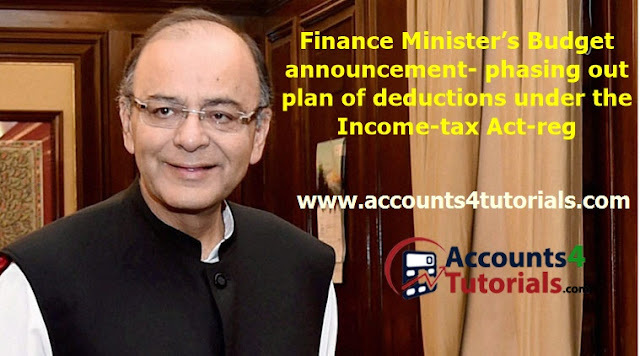 Subject: Finance Minister’s Budget announcement- phasing out plan of deductions under the Income-tax Act-reg-. The Finance Minister in his Budget Speech, 2015 has indicated that the rate of corporate tax will be reduced from 30% to 25% over the next four years along with corresponding phasing out of exemptions and deductions. This is a step towards simplification of tax laws, which is expected to bring about transparency and clarity. Profit linked, investment linked and area based deductions will be phased out for both corporate and non-corporate tax payers. The provisions having a sunset date will not be modified to advance the sunset date. Similarly the sunset dates provided in the Act will not be extended. In case of tax incentives with no terminal date, a sunset date of 31.3.2017 will be provided either for commencement of the activity or for claim of benefit depending upon the structure of the relevant provisions of the Act. There will be no weighted deduction with effect from 01. 04.2017. The details of proposed phasing out of deductions are available on the website of the Department at www.incometaxindia.gov.in. Comments on this proposal may be sent within 15 days to Director (TPL-III) on mail at dirtpl3@nic.in or by post at Director (TPL III), Central Board of Direct Taxes, Room No. 147G, North Block, New Delhi- 110001. 1. The Finance Minister in his Budget Speech, 2015 indicated that the rate of corporate tax will be reduced from 30% to 25% over the next four years along with corresponding phasing out of exemptions and deductions. This is a step towards simplification of tax laws, which is expected to bring about transparency and clarity. There will be no weighted deduction with effect from 01.04.2017. (i) Section 32 : The depreciation under the Income-tax Act is available up to 100% in respect of certain block of assets. The highest rate of depreciation under the Income-tax Act is proposed to be reduced to 60%. This is proposed to be made applicable from 01.4.2017. The new rate is proposed to be made applicable to all the assets (whether old or new) falling in the relevant block of assets. (ii) Section 35AD: of the Income-tax Act provides for 100% deduction of capital expenditure (other than expenditure on land, goodwill and financial assets) incurred by certain specified businesses such as laying and operating a cross-country natural gas or crude or petroleum oil pipeline network, building hotel (two star and above), warehousing facility for sugar etc. However, in case of a cold chain facility, warehousing facility for storage of agricultural produce, an affordable housing project, production of fertiliser etc. weighted deduction of 150% of capital expenditure is allowed. It is proposed that no weighted deduction will be allowed on any specified business w.e.f 01.4.2017. (iii) Section 35AC: No deduction under section 35AC will be available from financial year 2017-18 (Assessment Year 2018-19). deduction under section 35(2AB) of the Income-tax Act is proposed to be limited to 100% from Financial Year 2017-18 as against 200% available up to 31.03.2017 under the Income-tax Act. (v) There are certain tax incentives which at present do not have any sunset date for commencement of activity. It is proposed to provide a sunset date of 31.03.2017 for commencement of activity in the following cases:- Development, operation and maintenance of infrastructure facility [Section 80-IA (4)(i)]. Development of special economic zone (Section 80-IAB). Export of articles or things or services by a unit located in a Special Economic Zone (Section 10AA). Commercial production of natural gas in blocks licenced under CBM-IV and NELP VIII. [Section 80-IB(9)(iv)&(v)]. Commercial production of mineral oil from blocks licenced under a contract awarded up to 31.03.2011. [Section 80-IB(9)(ii)]. No weighted deduction is proposed to be provided under Section 35CCC and 35CCD from 01.04.2017. However deduction up to 100% of expenditure referred to therein shall be available.